The broom tree is a place of desolation and despair. Learn how Five Talents meets women and men in extreme poverty and sets them on a journey of hope. Looking for a good book on cross-cultural missions that inspires? Check out our list of Favorite Mission Books. We were delighted to learn that Wilson Memorial Union Church in Watchung, New Jersey organized a Market Day for 4th-6th graders who had used the Five Talents Sunday School Curriculum. Can you believe it? They raised over $350! "As the Minister of our church, I have to say I've never seen a program create as much excitement with the kids themselves as this one," said Reverend Barbara Peters. "I only wish I had experienced something similar during my time in Sunday School when I was young. And, our congregation was so supportive of all the children's efforts. It was memorable for them too!" Q: We understand that the Market Day your church organized was inspired by the Five Talents Sunday School curriculum. Can you explain how the event came about? A: We were looking for more from our Sunday School curriculum and really wanted to get the kids "hands-on" in a multi-week program that would take their Bible lessons to a new level and show how they can apply the Bible in their lives. The stories for the upcoming weeks all included the theme of "poverty," so we chose that theme. I began looking for help online to build a program and found Five Talents! It was perfectly linked with what we wanted – and so flexible. It was perfect! I particularly loved that Five Talents does not just go in and provide people in need with a temporary gift of food or money, but rather teaches them to develop a business that can sustain them and their family for years to come. Q: Would you recommend the curriculum to other churches or Sunday School programs? If so, why? A: I would absolutely recommend this program to all Sunday School programs! Many curriculum options out there cover the Bible stories and reinforce with games, crafts, and activities, but nothing makes the Bible story "real" to them like a program, such as Five Talents. That is what really sparks the kids' interest – to touch them personally and enable them to make a "real" impact in this world. Also, in many programs, younger children are able to take part in activities like food pantry collections, coat sorting, and making medical kits. These are wonderful but lack the direct feeling of impact that Five Talents makes possible through the videos and stories of the actual people you are helping! Q: The photos of the children using their talents to help micro-entrepreneurs are simply wonderful. Why do you think they had so much fun putting this together? Did any of the children mention "lessons learned" or takeaways from the experience? A: Oh yes! Our children have never been so excited about coming to Sunday School, and attendance is up! We often talk about using our talents that God has given us to "make the world a better place," and I don't think they have had such a direct feeling of being able to do that as they did with the Market Day project. The opening lesson placing them in a "role" of poverty was very successful in making it "real," and they even connected with the people they were portraying. Having them create their own business plan and come up with a "product or service" helped them understand what the folks you help go through, and they really got into it and "felt it". They all came up with their own great products and services. Some of them even worked on them at home! The Church purchased all of the materials they needed to keep track of the budget and make it less work for the families outside of Sunday School. We linked the "Market Day" sale with the holiday season and our Advent Workshop and Potluck Supper, which was perfect and really helped their sales. The kids really ran the sale, managed the money, and monitored the products on their own. 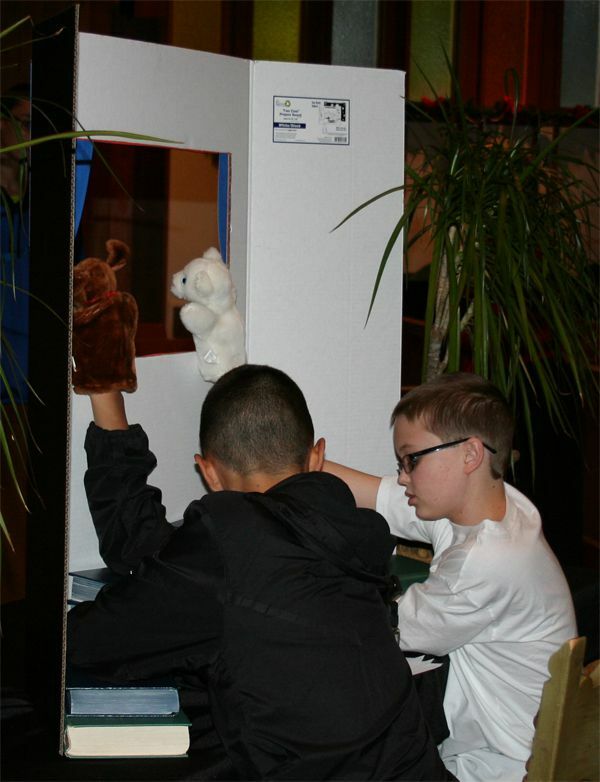 The boys who did the Puppet Show even sold advanced tickets and put a donation box outside the Sanctuary during the show. So clever! We were so impressed with them all and saw the "reward" they felt on their faces. If you could see their faces when we would watch the videos – they would ask, "Are those the actual people we are helping"? Abby created and sold these lovely gift boxes. "It was nice to know that something I made could help someone else make something with their hands for themselves," she told Kim, adding, "I can't believe so many people wanted to buy my boxes!" This is the "Hot Cocoa" table run by Nick, Doyle, Thomas, Calvin, and Robert. 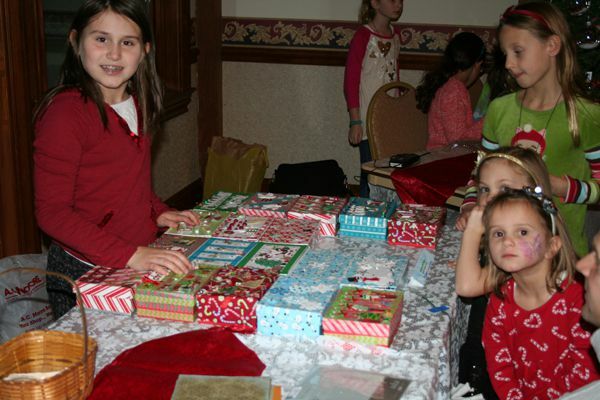 Meredith and Melanie selling many "rainbow loom" items they – along with Jenna (not pictured) – made themselves. "What I liked most about this project was the fact that we were able to make people happy and help them," said Melanie. Ben and Aaron came up with the idea of a "Twas the Night Before Christmas" puppet show that filled the pews! They sold $1 tickets in advance and had a donation box outside the sanctuary. "It feels really good that we made such a big impact," said Ben. Taylor selling her live Terrariums. She came up with the idea herself and made them during Sunday School classes with the help of friends. Churches play an important role in ministering to the vulnerable poor. Discover how churches are helping to fight global poverty.